It appears that the Malaysians were arrested for online scamming, but claim they were lured to Cambodia by scammers offering lucrative jobs. KUALA LUMPUR: Putrajaya has sent a diplomatic note to the Cambodian Foreign Affairs and International Cooperation Ministry to release the 47 Malaysians currently detained in Banteay Mancheay, some 400km from Phnom Penh. The Foreign Ministry, in a statement, said the diplomatic note was sent by the Malaysian embassy in Cambodia. Wisma Putra said the embassy in Phnom Penh was only informed by Banteay Mancheay police of the matter on Dec 28, more than two weeks after their arrests, on Dec 11. “Following notification of the arrests, officers from the embassy in Phnom Penh made a consular visit to the detainees to ensure their wellbeing after receiving detailed information and approval from the local authorities. The visit revealed that most of the detainees were offered jobs with an attractive pay. “Officers from the embassy (also) had a meeting with prison officials and the judge of this case,” the statement said. The statement also said that Wisma Putra, via the Malaysian embassy in Phnom Penh, was closely monitoring the case and was prepared to render the necessary consular assistance. That’s like saying “I didn’t know what was in the package” at customs. KUCHING: “Mummy please don’t worry about me, I am okay here. There are friends looking after me here. I will go back, but please wait. Sorry mummy, I have made mummy worried. I work to earn an income for our family. Sorry mummy, for making mummy disappointed. I love u so much. Please look after your health mummy, I am okay here. I love u so much mummy. I am safe here. That’s all mummy”. 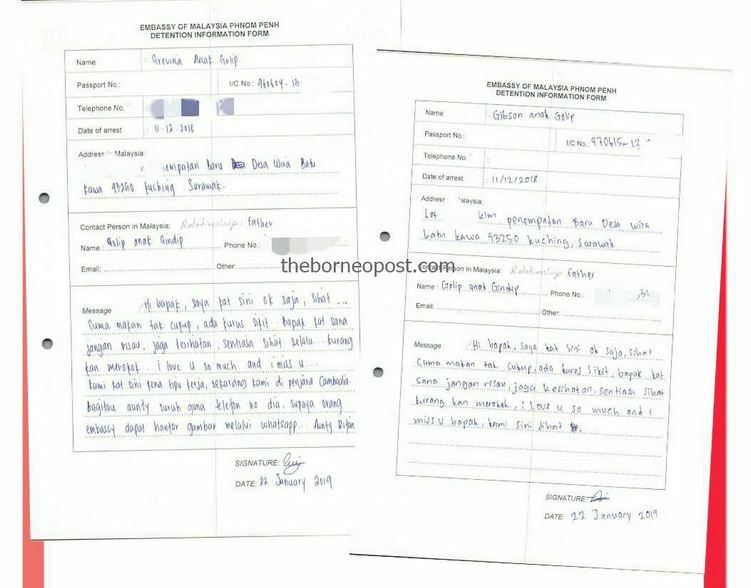 The above note was written by Brenda Welltinnie Winston in a 64-word message dated Jan 22 written on the Malaysian Embassy in Phnom Penh detention information form which was sighted by The Borneo Post. The 21-year-old was among the 47 Malaysians currently being held in a Cambodian provincial jail for alleged involvement in illegal online gambling. It's no big deal. The OZ government and Qantas would do the same for any Australians. Further information on the case here: it is alleged that eight Chinese nationals connected to the case were released without charges after being arrested in the police raid in December 2018. PUTRAJAYA: Foreign Ministry thanked the Cambodian government for ensuring the release of the 47 Malaysians who were detained in the Banteay Meanchey prison recently. In a statement last night, the ministry confirmed that all 47 of them had been freed as of 7.30pm (Malaysian time). “The Malaysian government wishes to extend its special thanks to the Honourable Prime Minister of Cambodia, His Excellency HE and the Honourable Deputy Prime Minister who is also the Minister of Foreign Affairs and International Cooperation of Cambodia, His Excellency Prak Sokhonn for the personal attention given on the matter. “The Ministry, together with the Sarawak state government working with the Cambodian authorities to arrange for the detainees to be sent back,” it said before reminding all Malaysians to be cautious of similar job opportunities offered in foreign countries. It advised Malaysians to be extra wary and to always verify the prospective employer’s information before taking up such job offers. It was reported that the 47 Malaysians were detained in Cambodia since Dec 11 last year on charges of cheating, initiating and carrying out illegal online gambling activities. They claimed to have been duped by a job agency syndicate. Of course the Chinese would never be involved with this type of activity. Those sneaky Malaysians tricking them into being in the same building too. Cambodian Nationals need onward ticket entering Malaysia. Well.. that's the on the road local knowledge I seek today. Anyone else following the turmoil /corruption in Malaysia? Cambodian Maids to be Repatriated from Malaysia.